Here I am complaining about not getting a ride to the bank on Friday when I should be thanking the Lord there will be money in the bank that day. I thank Him that I can order groceries on line and they will be delivered within hours. I’ll manage somehow to get the quarters I need for my laundry. Father, thank You for blessing me with a great church that helps me out. Thank You for helping me to get rides to church so I can fellowship with my spiritual family. Amen, amen, Nancy! We have so much for which to be thankful. There’s really no end to the list once we start thinking about it. Bless you, my friend. Hi Nancy. I’m so sorry–I thought I’d responded to this already. I so enjoyed reading your thoughts here, and how you obviously chose to be thankful. 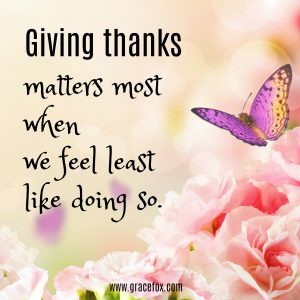 Your example showed beautifully how to give thanks rather than whine. It’s a deliberate choice we make, and it’s so worth it. In Everything Give Thanks. Gratitude and Appreciation lead to a life of ABUNDANCE!!! !